Ginger and garlic go together like peas in a pod. Or, better yet, they go together like owls and Tootsie Pops. 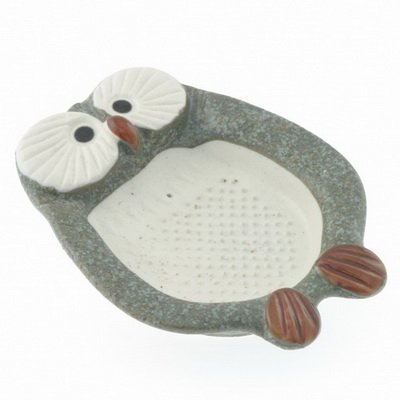 Which through a convenient leap of logic brings us to the Ceramic Blue Owl Grater . Designed for grating garlic and ginger (and Tootsie Pops as well for the adventurous), the handy Mr. Owl is an invaluable piece of kitchen gear for the wise. Bearing a striking resemblance to a certain 1934 Ford Model 730 Deluxe Sedan, the Gangster Grater from DCI Gifts can make any cheese look like Swiss cheese. No, it won’t put holes in your cheese, but it will reduce any block of cheese to shreds in mere minutes. With no fear of any law enforcement planning an ambush. 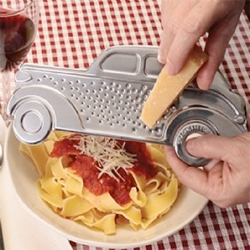 This Gangster Grater is a clever cheese grater that is shaped like a gangster car with bullet holes! 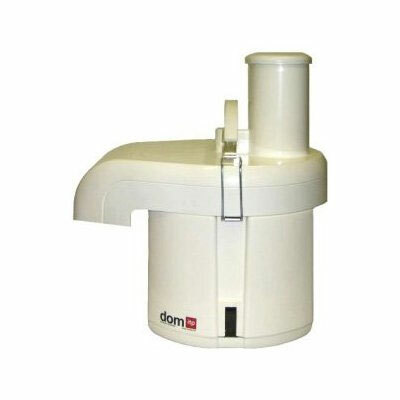 Made with stainless steel and rubber edges, this unique cheese grater also works as a measuring device for single serving spaghetti meals. Simply insert spaghetti rod into the tire for a perfect measurement. Add some excitement to your next meal with this gangster cheese grater! Hand Wash only. Blocks of cheese getting you down? Wouldn’t you rather see that solid, imposing block transformed into something more useful and ready to eat? Like shredded cheese, of course; shredded cheese for which to top everything. 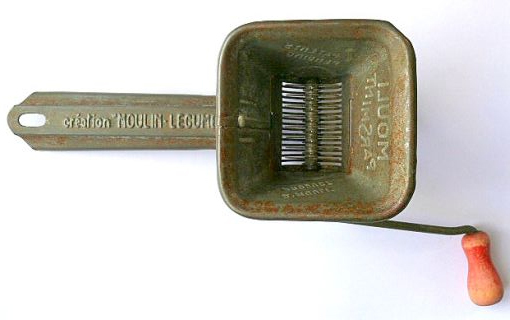 Cheese nubs (and other small items) can be treacherous to grate. They are hard to get a grip on, and when you do wrangle them in, they eventually get too worn down to grasp. 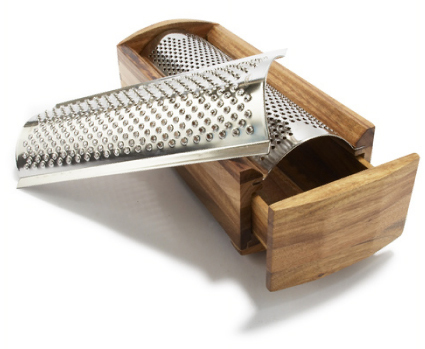 The Microplane 3-Piece Grater Set makes it easy to work with such items. 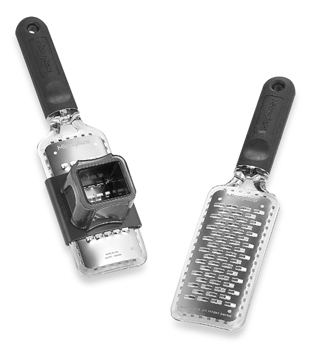 The set includes an Extra Coarse Grater and a Medium Ribbon Grater, while the slider attachment saves fingers from all those hard-to-control items. If not for your fingers, perhaps for those that belong to whom you love; it is officially gift season after all. And all this time you thought it was the day after Thanksgiving.